Here we are at Casa Loma Apartments in Tustin, CA to swap out an old 1960’s “bar pool table”. 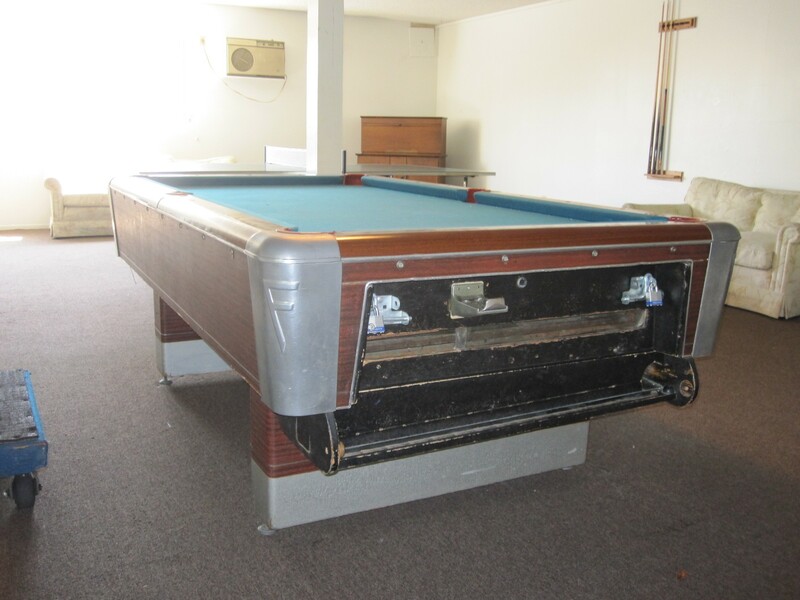 This 45 year old Fischer coin-operated pool table is being replaced with a brand new C.L. Bailey eight foot “Renegade” pool table. The apartment manager was tired of dealing with all the tenants’ complaints about balls always getting stuck on the inside of the old “bar” pool table. So the apartment’s owner decided to buy a new pool table from us. It’s pretty cool because C.L. Bailey, the parent company of “Fischer” pool tables is still in business making pool tables in Marionville, MO. and the old Fischer pool table was made in Tipton, MO. The “Renegade” is great starter table, it features one inch three piece slate and full size K-66 cushions for exceptional play. Here at DK Billiards we love to share the wealth of information we have about pool tables. But, we unfortunately cannot trace a serial number on a Fischer pool table. Fischer was very proud of their billiard tables and placed a serial numbers on all of them during this mid-century period. These records are long gone in the 21st century. We also have a hard time giving you a value of these pool tables if you are not in the greater Orange County, CA area. Each value is regional and varies greatly by where you are located and, like all antiques, what someone will ultimately pay for it. Please feel free to share your serial numbers here in the comments section, along with any information about approximate age of your Fischer and your location. We love to hear from folks all over the United States and hopefully we can compile some information about mid century Fischer pool tables for you to peruse. Just to reiterate: Here at DK Billiards we love to share the wealth of information we have about pool tables. But, we unfortunately cannot trace a serial number on a Fischer pool table. Fischer was very proud of their billiard tables and placed a serial numbers on all of them during this mid century period. These records are long gone in the 21st century. We also have a hard time giving you a value of these pool tables if you are not in the greater Orange County, CA area. Each value is regional and varies greatly by where you are located and, like all antiques, what someone will ultimately pay for it. We are now closing the comments for this post. I have a Fischer Empire VIII SN 810939 regular pool table NOT coin op has rails for balls to collect at the end of the table. Just looking for the correct ball size (I saw above were you posted for the coin OP table) I know it needs new felt on it, its a one piece slate table. I’ve a Fischer Empress One Hundred One 4×8 1″ slate. It’s at least 40 years old. New cushions and cloth. Was wondering what it is worth? Thanks.. I recently got a fischer pool table. Serial number 57589 any idea on the worth? I just inherited a Fischer Cavalier VIII pool table from my dads estate. I don’t have room for it and need to sell. I see prices are ranging from $200 to $1200. I live out of state and can’t measure it, but tag says “FISCHER MFG. CO.,INC. TIPTON, MISSOURI SERIAL NO. 86933. I’ve read through your blog, particularly focusing on Fischer. I have a Fischer 8 foot home model S/N A100593. The setup manual lists it as a Castile III and the color spec sheet shows it as a Marque III, by Fischer a division of Questor, California, MO manufactured in Tipton, MO. Both have identical images/drawings so I’m not sure exactly what to refer to it as. I am the original owner and purchased this around 1975 while living in Wichita, KS. I’ve moved it 7 times, 6 of those personally, recovered it 4 times and replaced the cushions once. Unfortunately they need to be replaced again. When I do this I would like to repair the corner caps, which were always a problem. Because of their design and being plastic clothing, etc, easily snagged them and eventually broke them. In reading your blog I see it is unlikely to impossible to locate any original parts for these tables, however I was hoping to find some that will work. For example pooldawg has some apron mitres but they are an inch too short on the angle. All other measurements are perfect. Same issue with the caps. I was hoping you may be able to point me a source for caps. The corners are actually still in good shape as they are metal. I also was wondering if you can tell me if the cushion K66 cushion material that I see on line at various sites is good to use? Most of them are around $45 When I had the cushions done I took them somewhere and it’s only been a few years when the original cushions lasted 20 years or so. Thanks in advance for any feedback you are able to provide. Dave, I would apprecite knowing the approx. value of my Fischer Model# J33747 H pool table (located in PA). It is 6′-7 3/4″ x 3′-3 1/4″ from bumper to bumper, coin operated and has been recovered with new bumpers (approx. 15 yrs. ago). The previous owner bought it in the mid-60’s (he thought in ’66 or ’67). The plate indicates “Fischer a Division of Questor Tipton, MO”. Any comments or info about this table is appreciated. I’d like a little bit of history perhaps on this Fischer table that I acquired when I bought my home. The serial# tag shows A87232. Mainly I’m looking for the timeline when it was manufactured and what sort of value it may hold if any. The felt is in OK shape. No rips tears or imperfections, bumpers are worn but not completely gone. Unfortunately, it’s got to go…problem is…finding someone whose willing to to take it out of my basement! Does $300 obo sound reasonable for it? Thanks. Hello Aaron, I think that starting at$300 id fair. If you have time on your side then you can stand pat for a while. The downside to this pool table is thst it’s a one piece slate and thus very, very difficult to move. Aloso very costly to move if the buyer chooses to hire a professional pool table mover. So see hoe that goes and if you don’t get any bites then just lower price a bit. Good luck my friend, Dave. I have a fisher empire VIII pool table serial number 745359 and I am wondering what the value of the table would be. It is in great shape except they felt could be replaced. Moving it would be easy as it is in my heated garage. hello Jeff, the area in which you live has a big outcome of the value of your fischer pool table. Here in So. Calif. We would probably sell a similar pool table used for around $1200 but we’d also be including new felt and in home/garage delivery and install. If you were local to our area I’d say you could sell it private party and hopefully get $500 with the buyer to assume all additional expenses. Hi pool table king I am trying to find the value of this Fischer 8′ serial# 86636. New looking red felt and nice cushions. Don’t know which model but its not coin-op and it has the white ivory looking diamond shape in-lays all along the top rails. It is worth however much you paid for it. 😉 Unfortunately, most pool tables of this era don’t have great monetary value. The are fun and look really cool, though. Would you have any idea how to disassemble a Fisher Empire modle viii? I got it for a steal but it is physically impossible to get it in my house otherwise. Nice table Siro, You need to start by removing the false panels on sides and on the head end of the pool table. After removing panels you’ll see slots which have brackets which pinch against the slots and the bottom of the slate, which is what keeps the rails tight. So you need to loosen the nuts enough (without dropping them on the inside of the cabinet) which will allow you to rotate the pinch bracket 90 degrees. In total there are 15 brackets, the foot end of the table does not have brackets it has something like a square washer that has a slot cut in it to allow you to rotate it out of the way of the nut. So loosen those three nuts just enough to allow you to slide the rotating square washer thingy out of the way. At this point the rails should be free to lifted off of the slatebed. At this point all you need to do is have some help to remove the one piece slate (which weighs about 450 lbs.) 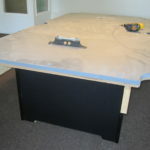 The leg pedestals can be removed from the cabinet after you remove the slatebed. If my memory serves me correctly, I think you can even split the whole cabinet in half by unbolting from the inside two or four carriage bolts. Then you can separate the cabinet in half kind of where the side pockets were. Good luck, Dave. this Fischer 44 1/4″ bumper to bumper, 8′ 1/4″ corner to corner 8′ table is missing 2 of 4 corner plastic pieces as seen with the eleven ball. The serial number is A07971. There are a few glue-like imperfections on the felt that I did not attempt to hard to get out, as can be seen by the triangle. Any idea of its era and a fair price to ask a buyer? Hey Drew, looks like an ok pool table, needs new felt but the buyer can pay for that if he chooses. I’d say you should ask anywhere between $400-600 depending on how difficult the disassembly and removal from it’s current location. Thanks for checking my blog out, Dave. Looking for legs for an 8′ foot ‘widow maker’. I have a fischer one piece slate table, serial number28331, can u tell me anything about it?what is the slate worth by itself? It Has ball return and is coin operated. Hello Justin, If the pool table slate you have measures 43″x83″x.75″ then its a standard one piece slate. Slates like this are commonly used in commercial 7′ coin-op pool tables. Its probably worth $100. if its in good condition. If its a 47.5″x91.5″x.875″ Then its a standard 8′ one piece slate, unfortunately there’s not much call for slates this size. I have three of them laying around my shop and have not had a need to use them or even had anyone looking to buy one. Thanks for your question, Dave. I have a Fischer pool table. I believe it is a corona hd. The serial number is A26953. It is missing the black plastic top corner piece. I know Fischer went out of business. Do you know of anywhere I can get the part for this to replace it. I tried to post a picture but was unable to. Trying to determine a fair selling price for a Fischer pool table, Serial #A81965 purchased in the 60’s. Do not have the model. The dimensions of pool table: 56” wide, 100”Length and 30” high. Can you also tell me if it is a single sheet? Thank you. Hello Amy, the value of any pool table is directly related to a few factors. First would be the condition of the felt and cushion rubber. A pool table from the 60’s probably has “dead” cushions. There is a way to test this. Standing at the side of the table you would roll a ball away from you, with medium power the ball should make 3-4 cushion to cushion contacts before coming to rest. Try this test on all six rails. Another factor would be the difficulty of removing the pool table from it’s current location, meaning stairs or difficult maneuvering. This Fischer pool table is most likely a one piece slate, but it’s possible to be a three piece model. As far as a value, it’s probably a cool looking 60’s style which may appeal to some folks because “retro” styles are in again. I’d say the pool table is probably worth between $500-1000. Good luck Amy. Have a 1912 Brunswick pool table. Looks to be a Madison edition. Any clue on the worth? Good shape have the origina balls, sticks, and pool racks. I have an Fischer Empire VIII table with original cushions and cloth. I believe the slate is fine but the cloth needs replacement. How do you know if the cushions need replacement- is the action just slow? Based on the age would you guess that the cushions need replacement? Is there a certain type of cushion, model and size that I would need to look for or is this not a factor as they are pretty much similar? Hi Nowell, the best way to test the action on your pool table cushions is by rolling one of the balls from side to side. Normal cushions will bounce back and forth 3-4 times before coming to rest. Rolling the ball from end to end should get 2-3 cushion to cushion contacts. If you’re not getting that kind of rebound then your cushion rubber is dead. I’d recommend using k-66 cushion rubber on your Fischer pool table. You’ll have to take off the whole rail section to remove the six smaller pieces that are screwed to the underside of the rail section. Good luck and thanks for your question. I need new Fischer meatal accents on the outside of the 4 corners, new rails, new pull out drawer by the ball return and a coin mechanism…Any Ideas??? Hi Theo, the parts for older Fischer pool tables are scarce especially the one you’re looking for. The rails or did you mean cushion rubbers? They are about the only thing that can be replaced. Are the other parts not there at all? If that’s the case you’d be better off just looking for another pool table. Regards, Dave. The table pictured is a Fischer Crown Imperial 90 circa 1962, they came out with the 85 in 1962 and the 90 & 100 a couple of years before that. In 1962 they added the Royal 77 and 90 that looked almost identical minus the metal corner pieces. There’s a scan on goggle of an article from the Nov 10, 1962 issue of Billboard Music Week (pg73) that announces the addition of the 85 to the Fischer line up and shows a picture of the above table. 24060. Is there any info you may have on this. It’s a 7ft. The Fischer Pool Table you removed (Picture #1), I have the same exact table and need parts. Do you know what year and modle that table was as I do not have any info on my table to go off of. Thanks for your comment Theo. what parts are you looking for. I just got a Fischer table serial a 63019, it looks like a Fischer Corona-KD, but only externaly, of the 3 models of that table model 2337- play area 39″ x 78”,seems the closest but not exact ,play area on mine is 3′ x 6′ . My question is what model is it , and what year was it made ? I recently got a fischer bumper table from my uncle. I would like to fix it up for sentimental reasons. any idea where to get the the 12 bumpers that I need. they are the ones that light up. Hi I just baught a Fischer emissary table and I can’t find this model any ware can any body tell me about it.its three piece 1inch slate. How do you open the compartment at the ball return on an empire V11 pool table ? Hi Pool Table king! I got an old Fischer pool table. It a 6 foot bar table an takes 2 dimes to play a game, the tag reads 108397. Any idea what year this table could be? I have a Fischer Duchess VIII pool table (#611030). It’s in very good condition. It has been recovered once with red felt. I am wanting to sell. Does anyone know what it’s worth? I’m in Lee’s Summit, MO. Well sir it’s probably worth $700. If the cushions need replacing drop the price a couple hundred bucks. Good luck. I’m receiving a Fischer Empire VIII, and am having a hard time finding movers for it. Do you have any how much the entire table weighs, not just the slate? If it’s not too unreasonable, I’ll just end up moving it myself. Thanks! Yes they do come apart. The slate is in one piece though and it measures 47.5″ by 91.5″ by 7/8″. Some of the the cabinets can even be split in half lengthwise. Good luck handling the “widowmaker”! Rory, just aquired an old Fischer Table, label reads…Fischer Sales and Manufacturing Co., Tipton MO. SN 128649. Any info would be a great help. Can you comment on if its marble or not and the year it probally is from thanks! I was wondering if you could give me any information on a Fischer Regent Seventy-Seven. I paid 100 for it and it has a Nickel Slot on it to pay to play. I was wondering era it was made..possible valuie and Im pretty sure its marble. Just wouild like a little info on it. Hello there Clinton. They’re great pool tables. Unfortunately there’s not a huge market for that style table. Just use it and have fun with it! Thanks, Dave. Sure thing! It weighs approximately 275 lbs. It’s not a widowmaker, but it might could be a ball buster. Good luck. I have a Fischer Duchess VIII pool table in good condition,serial number 92651. Could you please tell me what is is worth? Also, how do you break it down (remove the legs) to move it? Hello Pool table king. I have a co-worker who is trying to offload a sinlge slate Fischer pool table (see photobucket website for pictures). The problem is it is upstairs in a loft. Do you have any suggestions of how to handle getting this thing down and into a truck? He has decided if somebody can’t figure out a good way to get it out then he’s just basically going to destroy the slate. His wife has given him an ultimatum to get the thing out of the loft. I would take it but it just sounds like trying to deal with the “widowmaker” is not something I want to even mess with. Most “Movers” he’s talked to say they are not even willing to move the table. The railing on the loft is removeable. I just bought a Fischer table, old but in nice shape, 8′ table, one piece slate, ball return, no pockets, not coin-operated, serial #511456. I haven’t found anything indicating a model or year of manufacture. Looks much like the one pictured above. Trying to learn when it was built. Does the serial# and description above give you any clue as to its age??? Thanks much for your help. i picked up an old coin operated fischer pool table with one piece marble from italy, it has a sticker that says regent eighty-six and it only takes 1 dime to play. I have not looked close enough yet for serial numbers or anything, i was just wondering if u have any idea of how old it is and what it may be worth. it needs new felt. thinking about getting an old fischer regent 77.Could you tell me anything about it.Year,good or bad.It is coin operated .Looks to be in very good shape.Owner is asking 200.00?I just dont know much about it and cant spend money on a new one. I have a Fischer pool table as well, I don’t know anything about it except for what the stickers on it tell me. It’s coin op, serial number is 2687-08, and it has a sticker that says Imperial XII. It has patent dates from early to late 30’s on the coin thing. We’ve had this table in the family for a hot minute. I was told my grandpa got it out of a closing bar back in the 60’s. If you could give me some information on this table and possibly a value it would help. I’ve been looking all over the internet and haven’t found anything on this table. Hi Shayna, another Fischer has come out of the woodwork, huh? Well, the truth is the old Fischer pool table are great to have fun on. But, unfortunately don’t yield high resale values. Sentimentally speaking they’re priceless, but monetarily speaking, well, maybe $200-$500 dollars. Sorry to burst your bubble if you thought this old relic was going to send you on a trip to the Caribbean. 😉 Thanks for your comment. Hello, I picked up a 4×8 one piece slate top bar table badged as a Delta, a Questor Co., but under further review there is a Fischer tag on the inside, serial #41734J. 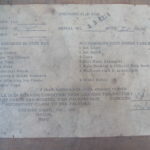 Can you use the serial number to tell me when the table was made, or give me any other info about the table. Thank you for your time. Hello David and thanks for your comment. Unfortunately I don’t know how their serial numbering system worked. I know the company of old was located in Tipton, MO. and was owned by Ewald Fischer. The company has long since been purchased by C.L. Bailey Co. of Marionville, MO. but it’s a whole different type of pool table being produced by the new guys. As for their value, other than sentimental, the old Fischer pool tables aren’t really worth a whole lot of money. They play great and look cool with 50-60’s style. Just keep the rubber cushions in good shape and play her til’ she treats you wrong. Rack Em’! I have an old Fischer 4×8 pool table (not bar table). Serial A53892 (no other markings). Need to know what size rubber bumpers it takes, should I just remove one and measure it? Looks like it was made in the 60’s. Other than the “dead” bumpers it is in excellent shape. You should be able to purchase standard k-66 cushions for an eight foot pool table. If you-re not into do-it-yourself projects we can handle it for you. Thanks for your comment. having a hard time posting pics. Can you send me your email and I will paste them as an attachment. Thanks! sure thing… give me a few hours. Thanks for the reply. I have a 8′ Fischer Countess table Serial #A04788 that I am looking to find value on. It is in Great condition except my daughter took a sharpie to the felt and drew around the “8” ball. havent attempted to clean it cause I dont want to ruin the felt. Any suggestions on cleaning too would be appreciated. Everything else on it is complete. Thank so much for your time. Hi Eric, do you think you could post some pics of your pool table? Thanks so much for the detailed information. If I lived in your area you would definitely have my business! Hi Jon, my husband usually installs k-66 rubber on the older fischer pool tables. Just double check the nose height, you don’t want it too high or too low. My husband usually sets the nose at one and thirteen thirty seconds of an inch, this will give you great ball performance. Thanks for your comments. My parents were just gifted with a Fischer Billards Table. It has marble not slate. Everything is a-1 Perfect on it. Not a scratch. Silver corners, with diamons in the brown top. Serial 63612. Any idea on a value? for insurance purposes. I have not been able to find much on it. thank you! That’s a great pool table. The value is going to be in the $500-1000 dollar range. Thanks for your comment. I want to sale my old Fischer coin operated pool table dint have the dimensions now but can get real easy. It is on my utility trailer ready to go. Let me know if any one is interested in it. It looks like everything is original and will need new felt. Hi Wanda, your pool table is worth $600. You must also consider the fact that someone will most likely be hiring a pool table mover to handle the hard work of disassembling the pool table and then carring the massive 450 lbs of slate that your old Fischer pool table has. Not sure if you’re in an area where pool table movers are abundant, being in Orange County, CA most pool table companies will decline to move an eight foot single piece slate table. Therefore this can raise pool table moving rates considerably. We typically charge our clients $400 to move an 8′ one piece slate pool table from ground floor to ground floor. Hopes this helps with your pricing expectations, Dave. Hello Wanda, you have an 8′ single piece slate Fischer pool table. Well the actual value depends on the condition of the felt and cushion rubber. Being that it’s over 40 years old may mean that the parts may need to be replaced. Also if the pool table is down/upstairs this will also subtract from what it’s worth to someone. I’d probably value your pool table in the $100-800 dollar range. Sorry I can’t be more accurate. Thanks for your comments. I have a 8′ slate Fischer Empire VIII in great condition. This table belonged to my parents it was purchased in the 60s. I have all the standard equipment ~ balls, cue sticks, chalk and rack. Unfortunately I do not have the space for it and would like to know what a good selling price would be . . . . . I have a Fischer table serial # 3073F in good condition. It is 7 ft. coin operated style. Could you give me an estimated value of it? How can I attach a photo to send you? Thanks. Oh yeah I still have them, I am able to play on the table it just has a couple of dead bumbers, but that may be because they are not secure due to the wood on the rails being stripped out. The wood of the rails needs to be replaced as well as the rubber. but the metal brackets should be ok. I don’t really care if it is orginal as long as it fits in place and functions as a decent working pool table. Do you know of anyone that may make the correct rails for it? I did find that Dynamo 6.5 foot table has the same length bumbers, but I am not sure if they will work because of how they attach to the table compared to the ones I have. Do you still have the wood rails or are they missing? I don’t think a standard Valley or Dynamo rail set will work for the Fischer. You might want to contact Fred at Penguin Amusement, he might be able to custom make you a set that will work. (866)772-3636 Fred. I just got a old 6 ft Fischer pool table coin op, I am looking for rails for it . Do you have any ideas of where I may find a set? Also need the brackets that hold the topface/rails to the table(sorry if i am caling the part names wrong)? Sorry Jason but at this time we don’t stock any original parts for old Fischer pool tables. The original Ewald Fischer Co. from Tipton, MO is no longer in business. But I’m sure we find cushion rubber for you. Do you have the old wood cushion seats still? As far as the brackets for tightening the the rail section down to the frame. You’ll have to purchase some square tubing and cut them into 7 inch sections, then drill a hole through the center slightly larger than .375 inches. This should work well for securing the rail section down to the slate. Good luck friend. Hi! we recently purchased a Fischer Billard Table, Empress One Hundred One, 8ft, coin operated,we are pretty sure it is a slate topp. Tonight we decided to try to search for info on the table. Your. site is the only place that has any info on the Fischer tables. It took 4 men and a dolly to get it into our house, so we understand the nickname ” The Widow Maker” ! We are very happy with this table, we would just like to know some history about it. Good morning Eric, Thanks for your interest in our pool table website. Yes, the empire VII is a seven foot pool table. It most definitely is a slate pool table, a one piece slate is common on all older Fischer pool tables. Depending on the condition of the pool table’s felt and cushion rubber will dictate the value. Also where the pool is setup in the seller’s home and the spot where you will setup the table are cost factors as well. If you plan to hire a pool table mover to do this job for you be sure to tell them of any stairs of tight turns because the slate is in one piece it is more difficult to maneuver. I would say that you should offer between $250-600 depending on this pool table’s condition and locale. Hope this helps, dk. Thank you very much. That is a lot more info than I had before. I have a Fischer Marque III pool table. It has been in the family for at least 35 years and made several moves. The corner plastic pieces covering the rail joints are broken. I have tried to find replacement pieces with no luck as yet. Would you possibly have any idea on where to go for parts like that??? any help would be greatly appreciated by my grandchildren who are now playing on it daily. Thanks for your comment Mike. Sounds like you got a great deal! Rory – I’ve got a Fischer Cavalier VII seven foot table. The table is in amazing condition even though it is around 40 years old. 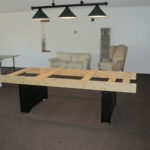 The table is a regular table, NOT coin operated, with drop pockets, and one piece slate. I have been able to find some info on other Fischer tables but not the Cavalier model. Could you tell me the approximate year built and the value? Thanks!! Is it one piece slate? Any info would be great. I’m having a child and it’s gotta move on to another household. Carlos, thanks for your comment. To the best of our knowledge all Fischer pool tables that are older than thirty years are all one piece slates. The Duchess name however is a mystery to us. The usual name for your table is regent or empire. Hope this helps. hello kenny, we appreciate your comments. occasionally we do acquire coin-op pool tables aka bar boxes. but at this time we don’t have any for sale, sorry. there’s usually a ton of them on craigslist. Finally, a site with a picture of a table much like mine. 🙂 I own a Fischer table almost exactly like the old coin-op one pictured above. The only difference is that mine is not a coin-op! It is in above average condition for it’s age. I purchased it for $150 back in 1990 from a family friend. They bought it new and had it in their basement for about 25 years before that. (roughly 1965) It sat covered and untouched for close to 20 of that 25 years. The table is what you would call a 7 footer, I guess, (38″) with a one piece “quarried marble” bed. It even has stickers on it underneath that say “Heavy ,not to be handled by one man alone!” The marble bed also has an ink stamp with the “F” logo and a date of “5, 63.” Anyway, I am not sure of the model as I think it is stamped on the original bumpers along with the date that are still on the table but under the felt. Can you tell me what that model I might have please? Also, what would a rough value be on this table? I will gladly send you pictures if you wish. Thank you very much. I just purchased a used fischer 7 ft table.it was rebuilt meaning new rails and new simonis cloth.but the height is only 28 half inches tall to top of rail,needs to be 32 inches. the legs just slide in a precut slot.any suggestions on raising the table to 32 inxhes????? You can try spinning the leg levelers down a bit. This might give you another couple of inches. 31-32 inches is a pretty standard height for pool tables. Do you have any information on a FISCHER POOL TABLE Model Regent 91E serial # 910950? It’s an old coin operated 7 foot table that I had refelted.I would like to know the value on it so I could put it up for sale. Thank you I also had a question of correct ball size anyway , again thanks for your time. The correct cueball size to use on most of the Fischer coin-operated pool tables is 2.375 inches. Also known as an “over-sized cueball”. Thanks for comments. Thanks for your comment Jeff. It depends on your leg pedestal design, are you going to install leg levelers? Or are you going to build them without the levelers, kind of like the c.l. bailey “renegade” pool table. The main thing to be concerned with is the total height of the pool table. Measuring from the floor to the top of the rail should be around 32 inches. When was this one built and about what would it be worth? Nothing can be found on a empire vIII. Is the model you have a coin operated one? What size it? 7′ or 8′? We just acquired a Fischer pool table and can find no info on it. The plaques on it say empire VIII, but I have googled that and found nothing. Happen to know anything about this? We have plenty of useful information on Fischer pool tables. What would you like to know Rodney? Hey Dave, I stumbled upon your site looking for info on a Fischer Empress table I will be picking up soon. I’m looking for cosmetic parts for it or anything else to give this table a makeover. Thanks, any info or help is appreciated! 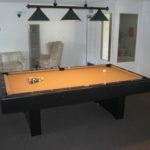 here’s the link with a pic of the pool table (http://newhaven.craigslist.org/tag/2040804338.html).